One of my favorite toys growing up was Rainbow Brite and all of her friends. I thought she was so beautiful! I even bought my daughter a Rainbow Brite costume for Halloween a few years back! Rainbow Brite is back! She's had a makeover and she is still spreading her positive messages of courage, kindness, and hope. 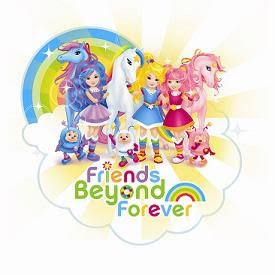 The Rainbow Brite website is interactive, where you can find FREE videos, a contemporary theme song, coloring pages, wallpapers, games and more! What I'm most excited about is the new Rainbow Brite doll that is out in stores right now! Have you seen her? She's beautiful! MomSelect provided us with some copies of the Rainbow Brite Adventure Pack CD ROM for PC & Mac. There's a short video, games & puzzles, the Rainbow Brite theme song, Meet Rainbow Brite & Friends, and more on the CD. My daughter and I have enjoyed this CD for the past few weeks together and separately (her of course!) and we want to share a few copies with some of my readers! I'm going to give a copy of this CD away to 8 of you! To enter, tell me who you'd give this CD to. This giveaway will end on 3/14 at noon EST. If I won, I'd give this to my almost 2 1/2-year-old daughter. She's just getting more into dolls but she already looks to be a computer whiz! I'm an e-mail subscriber: leigh_ramsey at hotmail dot com. I'd give it to my dd, but I would totally listen to it with her - LOVE rainbow brite!!! I would give this cd to my neice. My granddaughter would love it! !